Draft: 2006, San Diego Padres, 9th rd. 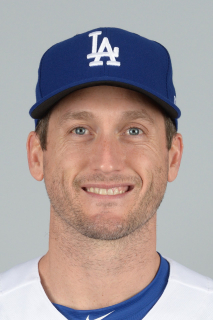 David Richard Freese (pronounced "FREEZE")...wife's name is Mairin...has one son; Kai Patrick (11/16/17)...Is a 2001 graduate of Lafayette High School in Wildwood, Missouri, where he was named a first-team all-conference, all-metro and all-state as a senior...played collegiately at Meramec (MO) Community College before transferring to the University of South Alabama...was named the Sunbelt Conference Player-of-the-Year in 2006…selected by the San Diego Padres in the ninth round of the 2006 First-Year Player Draft. Appeared in a combined 113 games with the Los Angeles Dodgers and Pittsburgh Pirates, slashing .296/.359/.471 with 38 runs, 12 doubles, two triples, 11 home runs and 51 RBI ... Acquired by the Dodgers on August 31 from the Pirates and in 19 games with Los Angeles, he went 15-for-39 (.385) with nine runs, two doubles, one triple, two homers and nine RBI along with a .489 OBP and a .641 SLG ... Defensively, appeared in 58 games (42 starts) at third base and 29 games (23 starts) at first base in 2018, posting a combined .977 fielding percentage (7 E/577.1 INN)…with the Dodgers appeared in 14 games (12 starts) at first base (.977 fielding percentage) and three games at third base (1.000 fielding percentage) ... Hit .321 against left-handed pitchers, along with six doubles, one triple, five home runs and 21 RBI…among hitters with 150 or more plate appearances against southpaws, his batting average ranked 13th best in the Majors, while his .387 OBP ranked 17th ... With runners on base, he hit .336 (45-for-155), which ranked the eighth best in the Majors (min. 150 PA)… batted .317 (26-for-82) with runners in scoring position and posted a .314 average (11-for-35) with runners in scoring position with two outs ... In the second half of the season, he posted a .310/.376/.516 slashline with 21 runs, six doubles, one triple, six homers and 26 RBI in 46 games…among hitters with a minimum of 125 at-bats following the All-Star break, his batting average ranked the 13th best in the National League ... Batted .364 with two home runs, a triple, a double and six RBI in 14 Postseason games for the Dodgers. Established a career high in walks and his .368 on-base percentage was the second-highest single-season total of his career (.372 in 2012)...Was Pittsburgh's most-used third baseman (116 games/114 starts)...Also made three appearances/ two starts (4/16 and 4/23) at first base...Hit .315 (34-for-108) with runners in scoring position; collected 13 hits in his last 29 at bats with RISP, dating back to 8/13...Was the Opening Day starter at third base for the second straight season...Was leading the Majors with a .576 OBP on 4/15...Was on the 10-day D.L. from 4/26 thru 5/11 with a right hamstring strain...Hit .321 (18-for-56) with 10 RBI in 18 games during the month of April...Accounted for the lone RBI in Pittsburgh's 1-0 win on 5/21 vs. Philadelphia; was hit by a pitch with the bases loaded, marking the first time since 1915 that the Pirates won a 1-0 game that way...Was ejected by home plate umpire Phil Cuzzi for discussing balls and strikes on 5/22 at Atlanta (second career ejection)...Joined Jose Osuna and Jordy Mercer with back-to-back-to-back home runs in the 10th inning on 5/24 at Atlanta...Hit his final homer on the road on 7/23 at Colorado...Collected his 900th career hit on 9/15 at Cincinnati... Hit .282 (6-for-213) in 62 games after the All-Star break...Was one of three finalists for the Rawlings Gold Glove Award at third base (Colorado's Nolan Arenado won). Was signed by the Pirates as a free agent on 3/11...His 141 games played fell three shy of his career high, set with St. Louis in 2012...Made 71 starts at third base and 34 at first base; also made two appearances at second base (5/3 and 6/16)...The Pirates went 59-45-1 in his 105 starts...Ranked seventh among National League leaders with a .337 average against left-handed pitchers...Also ranked fifth in the N.L. with a .364 average in interleague play...Was the club's Opening Day starter at third base; went 2-for-4 while batting third in his first game against his former club on 4/3 vs. St. Louis...Had first career three-double game on 4/24 at Arizona...Made his first career appearance at second base on 5/3 vs. Chicago (NL); did not have a chance while playing the final four innings there...Made his 10th career appearance and second career start at first base on 5/11 at Cincinnati; his first start there since July 2, 2011 at Tampa Bay as a member of the Cardinals...Also served as the leadoff batter on 5/11 - his sixth career start as the leadoff batter and his first since June 12, 2010 at Arizona...Tied career high (third time) with four hits on 5/30 at Miami...Left the game on 6/2 at Miami after being hit by a pitch (right hand)...Played in his 800th career game on 7/10 vs. Chicago... Tied career high (sixth time) with three runs on 8/9 vs. San Diego...Agreed to terms on a three-year contract extension (thru 2019) on 8/22...Connected off Chicago's Hector Rondon for second career pinch-hit homer on 9/26...Was the Pirates recipient of the Heart & Hustle award, presented to the player on each team who plays with a passion for baseball and maintains the values, spirit and traditions of the game. Spent second and final season with Los Angeles (AL)...Collected at least 25 doubles for the fourth straight season, joining Pablo Sandoval, Kyle Seager and Adrian Beltre as one of four third basemen to tally 25 doubles every season between 2012-15...Became the first Angels third baseman to hit more than 10 home runs since Troy Glaus in 2003 ...Became the third Angels third baseman in club history to post back-to-back seasons of 25 doubles and 10 home runs, joining Troy Glaus (1999-2001) and Carney Lansford (1979-80)...Made 113 appearances (112 starts) at third base...Was hit by a pitch a career-high 12 times (tied for ninth in the American League)...Hit .213 (36-for-169) in his first 46 games but .286 (73-for-255) in his final 75 games...Was placed on the 15-day disabled list on 7/23 with a fractured right index finger...Was activated from the disabled list on 9/1...Hit .308 (33-for-107) with 10 doubles and three home runs in his final 31 games after returning from the D.L. Played in 134 games during first season with the Angels, hitting .260 (120/462) with 25 doubles, one triple, 10 home runs and 55 RBI...25 doubles and 10 home runs were tied for second-highest totals of career (26 2B's in 2013 and 20 HR's in 2012)...After batting .155 (11/71) thru his first 20 games (thru April 27), went on to hit .279 (109/391) over his final 114 games of the season...The .279 clip in that stretch ranked third in the A.L. by a third baseman...Left game May 2nd vs. Texas with a small non-displaced fracture in his right middle finger (missed 16 games)...Registered an 11-game hit streak from Aug. 3-15...Only two other American League third basemen posted longer streaks in 2014: Adrian Beltre - 14 G and Josh Donaldson - 12 G...Went 3-for-6 as a pinch hitter...Connected for his first career pinch-hit home run July 5 vs. Houston...Was first pinch-hit homer by a Halo since Chris Iannetta on Sept. 4, 2013 vs. Tampa Bay. Completed fifth big league season with the Cardinals batting .262 (121/462) with a career-high 26 doubles, one triple, nine home runs, 60 RBI and 53 runs scored in 138 games...Was the first St. Louis third baseman with backto-back seasons of 25 doubles since Scott Rolen in 2003 and 2004... Posted a career-long 20-game hit streak from May 17 thru June 11...Batted .382 (29/76) during the streak with five doubles, three home runs and 16 RBI...Streak was the third longest in the Majors... Batted .300 (21/70) with three doubles, a triple, a home run and seven RBI during Interleague Play... Posted a .319 (30/94) average with four doubles, three home runs and 12 RBI in June...Was the first Cardinals third baseman to post those numbers in any month since Scott Rolen in June 2006. Remained on the active roster all season for the first time in his career. Appeared in a career high 144 games and made 132 starts, all at third base. Finished the season ranked 16th in the National League with a .293 batting average and 12th with his .372 OBP. Collected his first 20 homer season, hitting his 20th HR on 9/19 vs. HOU. His 20 homers where a career high, and finishedwith career highs in hits (147), RBI(79),runs (70) and doubles (25). Led the team with 36 two-out RBI,T10th in the N.L. Cards were 16-3 (.842 win pct.) when he homered, 34-9 (.791) when he had an RBI. Had 44 multi-hit games, T24th in the N.L. and also had 11 3-hit games (T23rd). Was the winner of 34th Man vote for N.L.All-Star team and went 0-1 playing two innings at first. Was given the team's Heart & Hustle award by MLBPA. Hit his first career grand slam as part of first career 2-HR game 6/7 at HOU, matching his career high with 6 RBI. Led the Majors with a .458 batting average & .562 OBP in July. Had a career-high 12 game hitting streak 7/16-8/1 (21-42, .500). 2012 POSTSEASON: In second postseason of his career hit .277 with one home run and 4 RBI...his sac fly was the game winning RBI at Atlanta during the Wild Card game...hit.421(8 19)during the Division Series against Washington...had two of Cards three hits in Division Series Game 1 vs. WSH, and hit RBI double in Game 2...doubled twice in Game 3 win and had one of team's three hits in Game 4 ...his walk with two on and two out extended the 9th inning of Game 5 clincher ...had five hits during the League Championship Series vs.San Francisco... hit 2-run home run in second inning of LCS Game 1 to put Cards on board. Played in a career high 97 games, making 87 starts at third and one at first base...Missed 51 games following a fracture to his left hand suffered when he was hit by a pitch from Scott Linebrink while batting atAtlanta on May 1. Had a plate put in his hand and returned from the disabled list on June 27 after six days rehabbing inMemphis (AAA). Played in four rehab games at Memphis (3-13, .231)...Ranked 3rd on club and 9th in NL with .356 BA at the time of his injury...Made his first appearance since 5/1 on 6/28 at BAL going 2-for-4...Recorded career highs in home runs (10), RBI (55), doubles (16), hits (99) and runs (41)...Led the club w/2 outs & RISP batting .364 (16-44) with 13 RBI in 2011; 29-90 (.322) career with 40 RBI. His eight gamewinning RBI ranked 3rd on the team...Had 26 multi-hit games, five 3-hit games. Picked up 2 hits in one inning (3 hits total) on 4/28 at HOU during Cards' 9-run 6th...Made his first career start at first base on 7/2 at TAM...Batted mostly out of the 6th spot in the batting order (.314), but also hit 5th (.292) and 2nd (.286)...Had 23 two-out RBIs during the season and legged out nine infield hits...Had a sac fly in 1st inning and two-run HR in 3rd on 7/10 vs. ARI to account for 3 of team's 4 runs...Left game 8/4 at FLA with a mild concussion after bases-loaded HBP to head and missed three games...Had a team high five-straight games with an RBI (8/12-16) for a total of 7 RBI...Recorded season-high five RBI on 9/21 vs. NYM when he drove in two with a triple and hit a 3-run home run...2011 POSTSEASON:.One of six Cardinals to play in all 18 postseason games, tying the Major League record and establishing a Cardinals mark...Named World Series and National League Championship Series Most Valuable Player...Became the sixth player ever to be named LCS and World Series MVP in the same season and the second Cardinals player(Darrell Porter, 1982). Became the ninth third baseman to win World Series MVP...Holds the all-time postseason mark with 21 RBI surpassing Sandy Alomar, Jr., Scott Spiezio and David Ortiz (19)...His 50 total bases set a new MLB postseason record...Drilled a 2-RBI double in the first inning of World Series Game 7 World Series, giving him an MLB postseason record 14 extrabase hits, posting a .794 slugging percentage which set a new Cardinals postseason franchise record as well...Tied the MLB postseason record with 25 hits joining Marquis Grissom and Darin Erstad...Batted .397 (25-63) in the postseason, the 2nd highest Cardinals postseason BA behind Albert Pujols (.414 in 2004)...His seven RBI in the World Series is T2nd all-time by a third baseman in a World Series behind Troy Glaus (8 in 2002)...His eight doubles matched the all-time postseason record set earlier in the World Series by teammate Albert Pujols...Batted .474 (9-19) with runners in scoring position during the postseason tying a National League record for hits...Became the seventh World Series MVP to hail from the same city/area as the team he plays, joining Larry Sherry, WhiteyFord, Pete Rose, Dave Stewart, Jack Morris and Troy Glaus...Was the hero of Game 6, tripling in two runs off Neftali Feliz in the bottom of the 9th with two outs and two strikes to tie thegame at 7-7, then hit a solo, walk-off home run in the 11th on a full count off Mark Lowe to win the game 10-9...When he hit his 11th inning solo walk-off home run to end Game 6 of the World Series, it marked the 15th walk-off home run inWorld Series history, the first in Cardinals World Series history and second walk-off hit in Cardinals WS history. Had notpreviously recorded a game-ending hit or home run in his career...Was honored as National League Championship Series Most Valuable Player after batting .545 (12-22) with 3 home runs, 9RBI, 3 doubles, 6 runs and he hit safely in all six games, extending his postseason hitting streak to 10 games...His nine RBI in the NLCS is tied for the most in an NLCS in Cardinals history and T2nd all-time (Ivan Rodriguez, 10, 2003)...His 12 hits in the NLCS were the 2nd most in Cardinals history (Pujols, 14, 2004) and T4th most in NLCS history. His .545 BAwas the highest of any player in NLCS history in a series that went six games or more...Posted a 13-game postseason hitting streak (10/2-22) establishing a Cardinals franchise record for postseason hitting streakand hitting streak in a single postseason. Batted .457 (21-46) with 4 HR, 16 RBI, 7 doubles and 11 runs scored during thestreak. Was the 10th longest hitting streak in National League postseason history...Became the fifth Cardinals player to win NLCS MVP honors joining Darrell Porter (1982), Ozzie Smith (1985), Albert Pujols(2004) and Jeff Suppan (2006)...Started at 3rd in all five Division Series games vs. PHI; doubled in Game 2 and had RBI single for Cards 1st run in Game 3.Led team offense in Game 4 with 2 RBI double & 2-run HR in 5-3 win...Hit 3-run HR in NLCS Game 1; RBI single & solo HR in Game 2; 3-4 w/2 2Bs in Game 3 win; hit 4th in Game 4, singled twice;and in NLCS Game 6 hit 3-run HR, 2B & singled, scoring 3 times...Doubled & scored in World Series Game 1 & singled and scored the Cards' lone run in WS Game 2...Tied Cardinals Division Series record with nine strikeouts (Jim Edmonds, 2004). Earned Opening Day start at third base, the first of his career...Played 70 games before a right ankle injury sidelined him for the season on 6/27...Despite his shortened season, still ranked 6th among National League rookies with a .296 batting average and 3rd in on base percentage (.361)...Finished with a .324 BA w/RISP (22-68), ranking fourth among Major League rookies...Of his 36 RBI, 20 came in his first plate appearance of the game and he tallied 20 RBI with RISP/2 outs...Had at least one RISP at bat in 70% (49/70) of games played and was successful 39% of the time (19/49)...Named NL Player of the Week (4/26-5/2), hitting his first home run of the season off Jair Jurrjens (4/29 vs. ATL) en route to a 6 RBI game...He was the first Cardinals rookie to have a six RBI game since rookie records began in 1957. It was the most by a Cardinal player since Chris Carpenter had six vs. CIN on 10/1/09. He also became the first of six Major League rookies to drive in six runs in a game during the 2010 season...Suffered a right ankle sprain on 6/5 vs. MIL and did not make a start again until 6/12...Placed on the 15-day disabled list on 6/29 (retroactive to 6/28) with a right ankle bone bruise. Began a rehab assignment on 8/2 but played in just one game at Double-A Springfield, reinjuring his right ankle...At the time of injury on 6/28 was second on the team w/ 20 multi-hit games and 2nd in the N.L. with a .364 home batting avg...Had surgery to repair a torn peroneal tendon on his right ankle on 8/5 by Dr. Thomas Clanton in Colorado. He later had athroscopic surgery on his left ankle for bone spur removal on 9/8, also performed by Dr. Clanton. Began the season in St. Louis, but a sprained left ankle injury caused him to spend time at four levels while rehabbingincluding Gulf Coast (R) and Springfield (AA), before finishing the season at Memphis (AAA). Called up to St. Louis (9/23) forthe end of the ML season...Compiled a .323 (10-31) batting average in 17 games in his first Major League stint...Recorded first Major League hit vs. PIT (4/8), a single off Zach Duke...Hit first Major League home run, a solo shot to centerfield at CIN (9/29) off Ramon Ramirez in the 9th inning...Went 2-for-3 with three RBI and caught the final inning of the last game of the season vs. MIL (10/4), his first catchingappearance since college (4/4/06)...During rehab, batted .455 with a grand slam (at Astros, 7/22) and six RBI at GCL, and .375 with a home run and five RBI in Springfield. Was also perfect 4-for-4 with RISP and two outs...Batted .331 with eight home runs and 30 RBI (1.027 OPS) in the 35 games at Memphis after returning from injury...Notched Memphis team-high six RBI vs. OKC  going 3-for-3 with a home run and double...Hit game-winning solo home runs accounting for lone runs in 1-0 wins vs. ABQ (9/11) in Game 3 clincher of opening round ofplayoffs, then again vs. SAC (9/15) in Game 1 of PCL Championship...Batted .318 (7-22) with two home runs and four RBI in AAA playoffs...Registered a .967 fielding percentage in 181 total chances (6 errors) at Memphis, including a perfect 80 TC at first base...Named 5th-best prospect in Cardinals organization by Baseball America. Played his first season with the Cardinals at Triple-A Memphis, skipping Double-A.... His .306 average ranked 2nd at Memphis as did his 142 hits, 26 HRs and 91 RBI. Ranked 3rd on the team with 29 doubles.Ranked T11th in the PCL with his home runs and RBI totals.... All but four (DH) of his games were at third base. Had a .967 fielding pct. to rank first in the PCL and his 216 assists were 2ndin the league.... Hit at a .360 clip (59-164) after the All-Star break. His best month came in July when he hit .378 (37-98) in 26 games.... Batted .314 (106-338) with 20 HR and 66 RBI against righthanders vs. a .286 (36-126) average vs. lefties.... Played in the Venezualan Winter League where he hit .235 over 14 games.... Was named to Baseball America Triple-A All-Star team.... Named Cardinals 9th-best prospect by Baseball America. Spent the entire season at Lake Elsinore (A) of the California League and led the team with 128 games played, 152 hits and69 walks. Ranked 3rd in the California League with 104 runs scored and 69 walks. His 246 total bases were 5th-most in the league. Was a mid-season and post-season All-Star. Went 1-for-2 with two walks, two runs and two RBI as starting third baseman inthe All-Star Game. Topped all qualifying third baseman in the California League with a .958 fielding percentage and led the league with 310 totalchances and 238 assists. Had a pair of 13-game hitting streaks, from 5/26-6/7 (.418, 23-55) and 7/11-24 (.411, 23-56). Collected RBI in six consecutive games from 6/21-27 (eight RBI total). Batted .356 (37-104) in 27 games during the month of May. Went 4-for-6 with a season-high six RBI on 7/15 at High Desert. Batted .351 (54-154) with runners in scoring position; .385 (25-65) w/ RISP and two outs. Drove in 10 runs and went 10-for-50 (.200) with a pair of home runs in 12 postseason games. Split his first professional season between Short-A Eugeneand Single-A Fort Wayne...combined, batted .317 (83-for-262) with21 doubles, three triples, 13 home runs and 70 RBI in 71 games...despite playing only 18 games for Eugene, finished third on theclub in RBI and tied for third in homers...hit .636 to win NorthwestLeague Batter of the Week honors for July 3-9...was promotedto Fort Wayne 7/7 and hit .344 (31-for-90) in his first 23 games...slugged his first career grand slam off pitcher Zachary Phillips ina 6-5 win 8/31 at Clinton. September 1, 2018 Los Angeles Dodgers activated 3B David Freese. August 31, 2018 Pittsburgh Pirates traded 3B David Freese to Los Angeles Dodgers for SS Jesus Valdez. May 12, 2017 Pittsburgh Pirates activated 3B David Freese from the 10-day disabled list. April 29, 2017 Pittsburgh Pirates placed 3B David Freese on the 10-day disabled list retroactive to April 26, 2017. Right hamstring strain. March 11, 2016 Pittsburgh Pirates signed free agent 3B David Freese. November 2, 2015 3B David Freese elected free agency. September 1, 2015 Los Angeles Angels activated 3B David Freese from the 15-day disabled list. August 23, 2015 Los Angeles Angels sent 3B David Freese on a rehab assignment to Salt Lake Bees. May 20, 2014 Los Angeles Angels activated 3B David Freese from the 15-day disabled list. May 17, 2014 Los Angeles Angels sent 3B David Freese on a rehab assignment to Salt Lake Bees. November 22, 2013 St. Louis Cardinals traded 3B David Freese and RHP Fernando Salas to Los Angeles Angels for CF Peter Bourjos and RF Randal Grichuk. April 8, 2013 David Freese roster status changed by St. Louis Cardinals. April 3, 2013 St. Louis Cardinals sent 3B David Freese on a rehab assignment to Memphis Redbirds. March 26, 2013 St. Louis Cardinals placed 3B David Freese on the 15-day disabled list retroactive to March 23, 2013. Lower back strain. June 27, 2011 St. Louis Cardinals activated 3B David Freese from the 15-day disabled list. June 21, 2011 sent 3B David Freese on a rehab assignment to Memphis Redbirds. May 2, 2011 St. Louis Cardinals placed 3B David Freese on the 15-day disabled list. Broken hamate bone in his left hand. November 2, 2010 St. Louis Cardinals activated 3B David Freese from the 60-day disabled list. August 15, 2010 St. Louis Cardinals transferred 3B David Freese from the 15-day disabled list to the 60-day disabled list. August 2, 2010 sent 3B David Freese on a rehab assignment to Springfield Cardinals. June 29, 2010 St. Louis Cardinals placed 3B David Freese on the 15-day disabled list retroactive to June 28, 2010. Bone bruise to his right ankle. October 19, 2009 St. Louis Cardinals activated 3B David Freese. October 7, 2009 St. Louis Cardinals reassigned 3B David Freese to the minor leagues. September 23, 2009 St. Louis Cardinals recalled David Freese from Memphis Redbirds. September 23, 2009 St. Louis Cardinals activated 3B David Freese. July 31, 2009 David Freese assigned to Memphis Redbirds from Springfield Cardinals. July 24, 2009 David Freese assigned to Springfield Cardinals from Memphis Redbirds. July 19, 2009 sent 3B David Freese on a rehab assignment to GCL Cardinals. May 16, 2009 David Freese roster status changed by Memphis Redbirds. April 20, 2009 St. Louis Cardinals optioned 3B David Freese to Memphis Redbirds.